Samsung Galaxy Gear is neither a matured nor an innovative gadget. But the options for a smartwatch in the market are still very limited. Some of you may get it at discounted price when purchasing the Galaxy Note 3. During the launch, Samsung made Gear be exclusive to Galaxy Note 3. It seems the strategy is not successful. 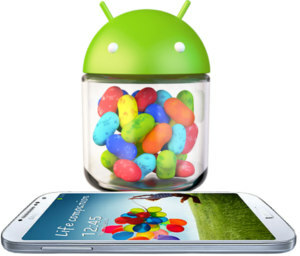 Now through Android 4.3 update, Samsung unlocks the Gear support to all Galaxy devices (with Jelly bean 4.3). If you are still trying to figure out what you can do on your S4 through with Galaxy Gear. Verizon has a 3-page guide on Galaxy Gear support on S4 for you. Samsung keyboard is not the best one, but it is surely not the worst. The updated keyboard seems looks better and not so cluttered. OpenGL Es 3.0 support was implemented in Android 4.3. But you need capable hardware (GPU) to utilize it. For owners of Galaxy S4 with Qualcoom chips (all US models, or international models with model number GT- I9505), congratulations, you can enjoy the OpenGL ES 3.0. This will significantly improve the performance of graphics (especially for 3D games) . For owners of Galaxy S4 without LTE (usually with model number GT-I9500), your S4 is NOT capable of supporting OpenGL 3.0. The Samsung Exynos Octa (5410) chip only supports E OpenGL ES 2.0. To be precisely, it is due to the GPU (SGX544MP3) used for this SoC. FYI, the Exynos Octa (5420) in Galaxy Note 3 does support OpenGL ES 3.0 because Samsung shifted to Mali-T628 MP6 (which supports OpenGL ES 3.0) for Exynos Octa 5420. ANT+ is the wireless technology that allows your monitoring devices to talk to each other using the ultra low power wireless protocol (ANT) running on the 2.4 GHz band. If you are involved in sports or fitness training, this could be very useful for you. You can connect your S4 to any cetified ANT+ sports, fitness and health sensors. Daydream was introduced in Android 4.2. But many Galaxy S4 owners are not aware of it. Basically, it is a screensaver for your Galaxy S4. It displays useful and delightful information such as photo albums, news, time and date when idle or docked. You can configure the streams, e g., Colors, Flipboard, Photo Frame and Photo Table. In Jelly Bean 4.3, photo daydream is enhanced. Reading mode can automatically tweak display settings to protect your eyes based on ambient lighting conditions, especially in night. The adjustment is no longer limited to brightness (as auto-brightness). It also adjusts the tone of the display to make it easier to read for long periods. You can select the apps that use this reading mode under Settings–Display-Reading mode (it may be different for different regions). For example, you can add Google Play Books or Amazon Kindle app to it. Actually, Reading mode was first spotted in Galaxy Note 8.0. It seems in Android 4.3 update, it works far better than that in Note 8.0. The No.1. complaint on Samsung’s Android devices is probably the bloated and sluggish TouchWiz. Users may want more fancy features. But a snappy interface is more desirable. In this update, the skin (TouchWiz) is still bloated. But it is not so sluggish compared with S4 before the update. Most users noticed that smartphones and tablets are getting slower and slower over time. When you got it new, it is snappy. But after a few months, it is getting slower and slower. One of the major causes of such slowness is the garbage in the storage. When you delete a file from your phone storage (NAND flash), they are not deleted: they are just “marked” as deleted (therefore they are not accessible). The space is not collected back directly. TRIM for SSD or NAND Flash is something similar to de-fragmentation and empty not-in-use disk space for a hard disk. In our Galaxy S4, TRIM will clean all garbage in the NAND flash storage and keep Galaxy S4 lean and mean over time. Android starts to support TRIM in Jelly Bean 4.3. Have you updated your Galaxy S4? What are the new features you like and dislike? Share with other S4 owners in the comment box below! You can try to so a factory reset. Please backup all your data before resetting. I no longer have an icon to easily turn my mobile data on and off 🙁 and a lot off the new features here I won’t/don’t know how to use. It should still be there. Did you check the quick setting panel? Same issue here. No mobile data icon, even on the quick settings panel. It’s not listed under the “notification pane” or the list of “available buttons”. Thumbs way down! Easy Fix: pull down the notification pane, hit the Grid View button at the top right. It’s not there anymore. The icon is gone gone. Hold down the power button and Bingo! toggle data. S-health not working after update. Factory reset may help. Backup your data before resetting. in my gs4 after updating 4.3 …my mobiles unlock effects in lock screen setting is disabled and favourite apps and widgets too is disabled on lock screen what shall I do ??? ?it is there but not highlighted I cant touch it …. I downloaded the 4.3 on my GT-I9500 , Samsung wallet is still not supported , any idea ? it depends on region. You can try to check whether you can find it in Samsung apps. When do we get to update S4 to 4.4 aka KitKat? After update, email notifications doesn’t run properly. I have to check everytime. Also some emails cannot be opened, although connection is very strong. Since I’ve downloaded Android 4.3 for my Samsung Galaxy S4 I no longer have any games on group play. Where are they or how can I get any? Did you try to check Samsung apps? After logging in with your Samsung account, it should list the games you played before. Hi, after my s44.3 update, I can no longer get the old style keyboard, it’s all qwerty which I absolutely hart…do you have any ideas? The old default is also qwerty, isn’t it? Or do you mean the Swype? Ok great, it’s downloading so fingers crossed. I also now keep getting a security message too. …is there a way to uninstall the update? Is it essential? No, there are no way back unless you flash the phone. It is a built in feature in Android 4.3. It will do its job automatically. I’m impressed with the camera. I was disappointed with the camera on my S3 after my Nokia N8 but was impressed with everything else. The S4 is everything I’ve looked for in a phone. I’m loathed to say phone though, it’s more of a personal communicator. I canot acces my SD card why?! My photos are missing!!! is it showing in the storage (settings–general- storage)? if not, you can shutdown the phone, remove the SD card and place it back, then start the S4.